No cassette deck has ever been an oil painting, but early examples of the breed were particularly nasty to look at. Seventies top-loaders, with their controls scattered haphazardly were fussy and unergonomic to use, while front loaders looked brash and imposing. As for the machines’ mechanics, forget it. Crude and clunky, they only served to confirm cassette’s status as the poor relation of open reel. But in 1974 Yamaha changed all that by making a machine that combined Compact Cassette’s strengths of convenience, size and flexibility, with near-open reel levels of sound quality. Until then, you had to choose one or the other. To do this they contracted Mario Bellini, responsible for some striking examples of Italian industrial design both as a freelancer and with the typewriter company Olivetti. The stunning TC-800GL was the result, nicknamed the ‘ski-slope’ thanks to its sharply raked wedge profile – a style regarded very much as ‘edge-design’ in the seventies. Like Bertone’s Fiat X1/9, Harris Mann’s Triumph TR7 or Guigaro’s Lotus Esprit S1, the Yamaha looked strikingly futuristic and quite unlike its drab, gawky competitors. But the ‘800 wasn’t just a case of a radical set of clothes hiding a bog standard cassette deck, because everything from the peak level meters to the power switch was made for maximum effectiveness and ease of use. For the casing, Bellini eschewed the then popular fake wood in favour of a tough, durable plastic covered in finely applied dark charcoal neoprene. Almost like suede to the touch, the finish instantly endeared itself to the user, making the deck less ‘machine-like’. The transport’s lightly pressured piano key controls were very slick in an era before cassette decks had solenoid operation, while its array of sliders for line and mic inputs, playback level and pitch were intuitive to use. 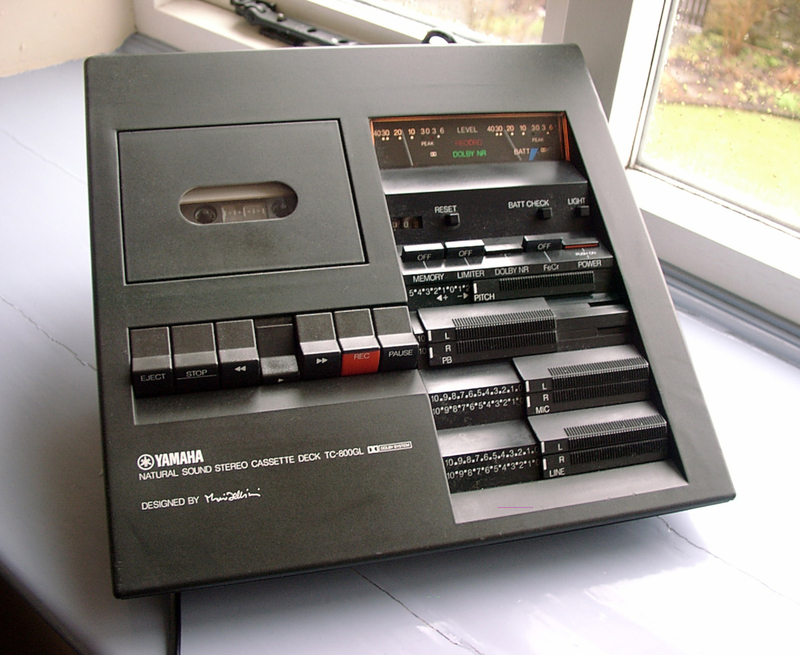 Although sparsely turned out, the deck was packed with (then) unusual touches to simplify operation, including automatic tape switching, timer recording, memory stop, and superb meters reinforced by green and red LED peak indicators to ease recording. All phono socketry was underneath the deck making it easier to hide unsightly cables, and there was an integral hinged stand, offering top loading or angled operation, making the deck easy to reach from any angle. Under the stand was a battery compartment, making the deck portable for location recordings, to the side a 12V DC input should the user wish to power it from a car battery. The packaging was inspirational, with an array of unique facilities together with a beautiful, functional face. Competitors pleaded the usual excuse that ‘things which look good invariably don’t sound it’, but the Yamaha’s performance said it all. Fitted with a good Permalloy head and a precision servo controlled transport the TC-800GL measured superbly by mid-nineteen seventies’ standards. With chrome tape Yamaha quoted an impressive 15kHz at -3dB frequency response, and an excellent 0.06 WRMS wow and flutter figure. Even today, a well preserved example is capable of sparkling highs, deep bass, and great image stability – quite an achievement for a forty year old design! The bad news is that these beautiful Yamahas are a pretty rare phenomenon these days, but do still pop up from time to time. Expect to pay between £100 and £250, depending on condition. It’s better to go for a pricier mint example rather than an old nail, as spares are getting scarce. Still, some major bits are still available. Best to covet your TC-800, use it gently and enjoy those stunning good looks – many believe that nothing has since come close for style. I remember seeing this in a magazine ad back when I was a child and being very impressed. Thank you for the very informative write up – looks like a great machine.